Home > Draper Natural History Museum > Wolf as Villain or Hero? Wolf as Villain or Hero? Controversy erupted like Old Faithful as soon as talk began about reintroducing the gray wolf to Yellowstone National Park. Unlike Old Faithful, that controversy has never really subsided. The sky-is-falling hysteria from some quarters in the 1990s and early 2000s has been muted a bit by the recent removal of wolves from the federal Endangered Species list and the stabilization of wolf numbers due to the carrying capacity of the environment, disease outbreaks, and legalized hunting. But the wolf is still vilified by many as the very essence of evil and glorified by others as a symbol of all that is right and beautiful with nature. The return of such an iconic and impactful species, especially with intervention by the federal government, was bound to become a lightning rod for ideologically driven pundits from all perspectives. There are some people who will blame the federal government and its nefarious “agent,” the gray wolf, for everything they perceive as negative in the Greater Yellowstone region and beyond, while others elevate the wolf as an environmental and social savior. Most of these stories fall into the category of dogma. Dogma is a widely held and often repeated belief that is not fully supported by empirical evidence. 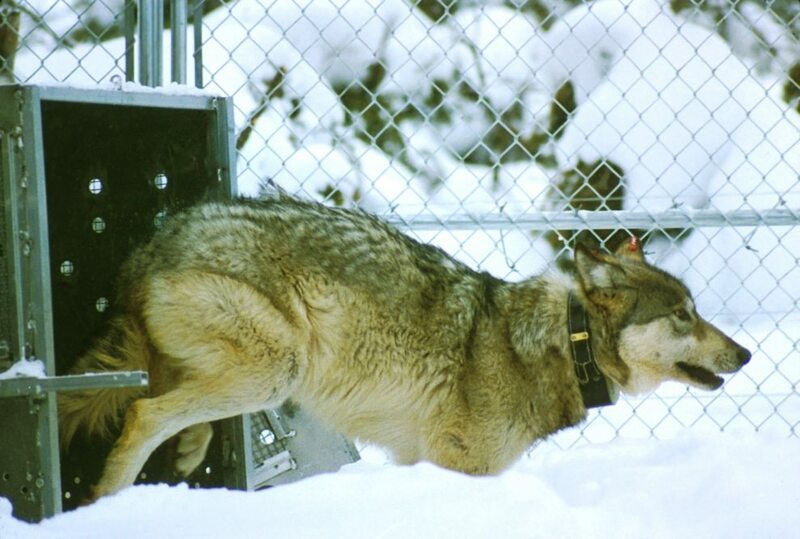 One of the first wolves to be released to restore the species in Yellowstone National Park in 1995. Science, on the other hand should be the anti-dogma. Science progresses by collecting, analyzing, and interpreting first-hand observations and data to develop the best explanations and understanding of nature. Scientists are charged with considering alternative explanations that might explain observations and data. But scientists are human, and sometimes a particular explanation becomes so appealing or fits our own limited observations that it quickly becomes dogma without adequate follow-up or critical review. As Yale Postdoctoral Fellow Arthur Middleton has pointed out in his March 9 OP-ED in the New York Times, “Is the Wolf a Real Hero,” the widely-held and often repeated belief that wolves have made Yellowstone a richer, more inviting place for songbirds and beavers by scaring elk may not be fully supported by all the empirical evidence at hand. The idea that a top predator’s indirect impact flows through many components of an ecosystem through direct impact on its prey has become an important and well-demonstrated principle in ecology. The phenomenon is referred to as a trophic cascade, and I’ve written about it in various venues, including a past Field Notes blog. Some researchers have proposed and presented evidence that wolves are at the top of a trophic cascade in Yellowstone whereby they reduce the number of elk and scare remaining elk from foraging leisurely on willow and aspen shoots and saplings. The increased growth of willows and aspen provide new resources for beavers, nesting songbirds, and other species. Some studies seem to support this idea, but as Middleton points out, other studies are contradictory. There is no evidence of increased willow and aspen growth in some areas where elk have declined significantly, factors other than wolves have reduced elk in areas where aspen has increased, and there are alternative explanations, such as longer summers and warmer temperatures, for increased willow growth in other areas. Middleton himself has reported no obvious change in elk behavior in response to wolves during his observations from 2007 to 2010, but there is no way to compare his observations to elk behavior without wolves prior to 1995. So, what is the take-home message? The primary message is one I’ve expressed before, but it bears repeating: ecology is not rocket science… it is far more complicated! There are many factors that combine to create and alter ecosystems, and it is beyond our ability to account for all of these factors in short-term, observational or experimental studies. The cascading impact of wolves on the Greater Yellowstone Ecosystem, as usually described, does not appear to be a satisfactory explanation for all of the observations and data currently available. The role of ecological science is to develop a real understanding of the complex relationships in nature. A real understanding of the impact of wolves on prey and on the broader Greater Yellowstone Ecosystem will come through long-term study that places empirical evidence above dogma and regards the wolf as neither villain nor hero. Meanwhile, federal and state wildlife managers will continue to develop and implement wolf management policies driven in part by best available science and in part by the values of society.